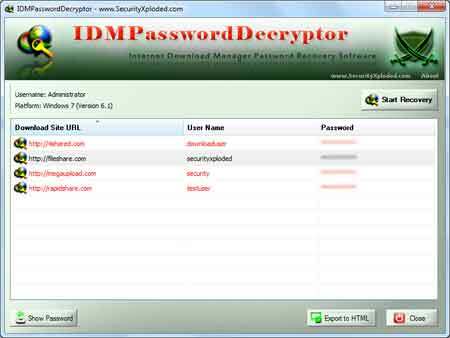 IDM Password Decryptor is the FREE software to instantly recover premium account passwords from Internet Download Manager (IDM). IDM is popular downloader software that simplifies and automates downloading file from many shareware and premium download sites such as Rapidshare.com, Megaupload etc. 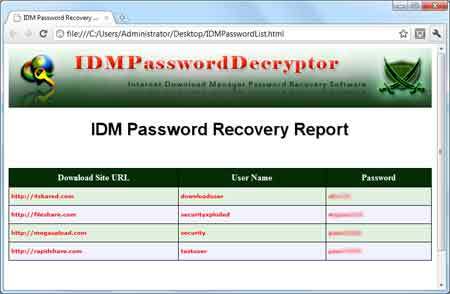 IDMPasswordDecryptor helps in quickly recovering all these stored premium account passwords from IDM database. It presents both GUI interface as well as command line version, the later is more useful for Penetration Testers & Forensic Investigators. IDM Password Decryptor works on both 32bit & 64 bit platforms starting from Windows XP to latest operating system, Windows 10. Instantly decrypt and recover stored premium account passwords from IDM. Command line Interface make it perfect for Penetration Testers. 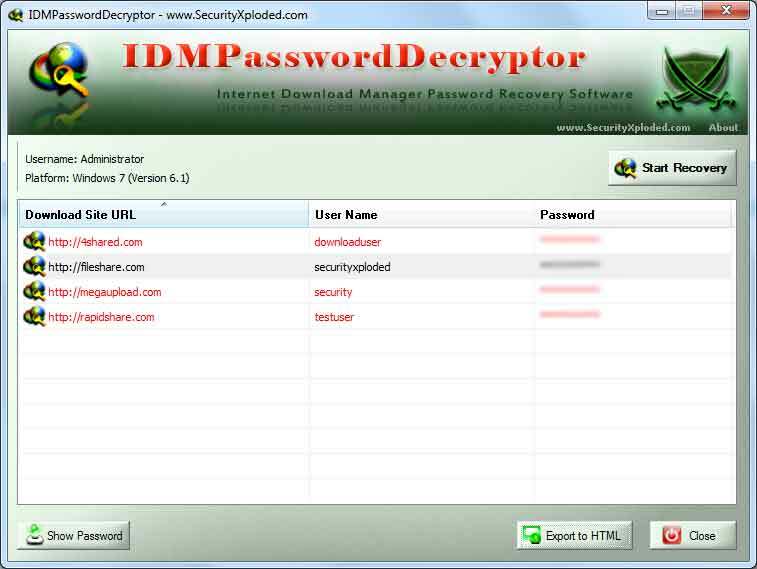 IDMPasswordDecryptor comes with Installer which helps in local installation & uninstallation of the software. It has intuitive setup wizard which guides you through series of steps in completion of installation. 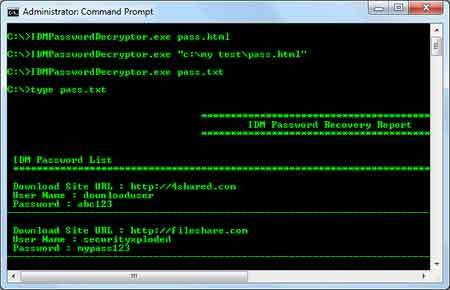 Launch IDMPasswordDecryptor on your system after the installation. Next click on 'Start Recovery' button. Instantly all the stored premium account passwords by IDM will be cracked & displayed as shown in screenshot 1 below. 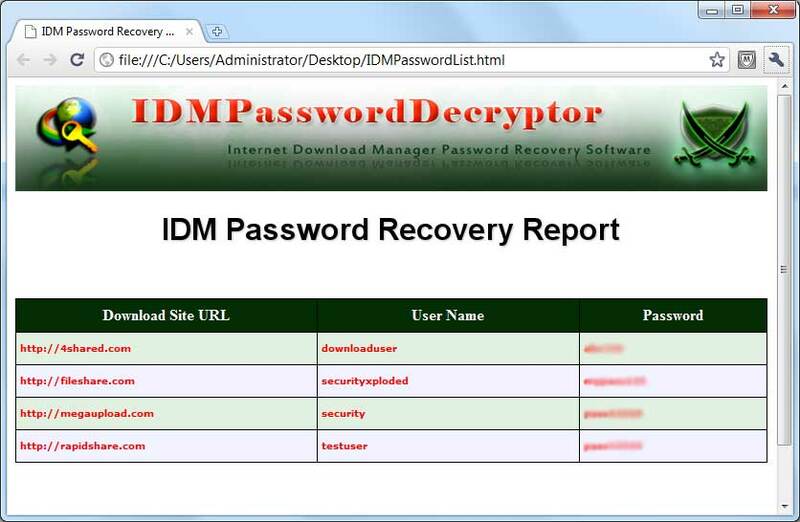 Screenshot 1: IDMPasswordDecryptor is showing the recovered premium account passwords from IDM. Screenshot 2: Command line usage of IDMPasswordDecryptor showing various examples. Screenshot 3: Exported list of of recovered IDM passwords by IDMPasswordDecryptor in HTML format. Major 2017 edition to support IDM Password Recovery on Windows 10. Enhanced GUI interface with glowing icon effects. Also integrated Uninstaller into Add/Remove Programs. Support for IDM Password recovery on Windows 8, Improved HTML reports and UI interface. Support for report generation in XML/TEXT format in both GUI/Command-line mode. IDMPasswordDecryptor is not a hacking tool as it can recover only your stored passwords. It cannot recover the passwords for other users unless you have right credentials.